PROMOTION! Original price 29.99USD, promotion price now ONLY 25.99USD, price will rise a 1USD while every 100pcs sold out! Update: We have implemented full inspection to every piece of our inventory, and guarantee every item is in good condition. Please be assured to buy. Designed for preschool-age children, recommend for young children ages 3 and up, has few small parts. children become familiar with basic musical concepts. Also can boost attention levels, memory, motor and creative skills. 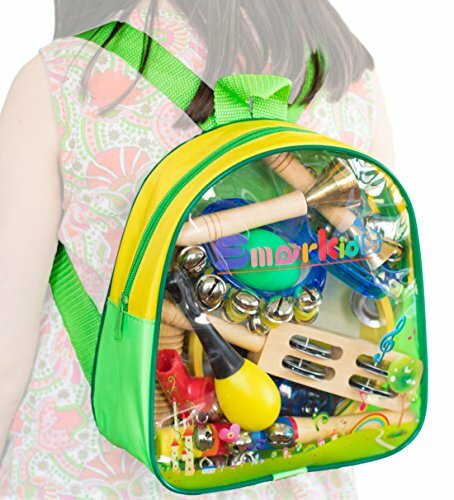 This musical instruments is designed a perfect size for young children. Parents can play together with kids,show them that there are so many ways to make music! as each child can have their own instrument. Play their favorite music in a mini band. ✅EASY CLEAN-UP and STORAGE: Don't worry about cleanup, we provide a high-quality zipper backpack for easy cleanup and storage. Perfect size toys and portable carry bag makes the toy management much easier and bring more convenience for your child. If you have any questions about this product by Smarkids, contact us by completing and submitting the form below. If you are looking for a specif part number, please include it with your message.